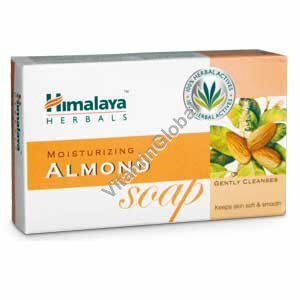 Himalaya Herbals Moisturizing Almond Soap enriched with almond extracts that moisturize, soothe and revitalize the skin. Ingredients: Rosa damascena Syn. R.centifolia (Satapatri), Citrus limon (Nimbuka, Lemon), Vetiveria zizanioides (Ushira, Khus khus), Rubia cordifolia (Indian Madder, Manjistha), Cocos nucifera (Coconut oil, Narikela), Prunus amygdalus (Almond oil, Vatada), Prunus armeniaca (Apricot, Urumana), Triticum sativum ( Wheatgerm oil, Godhuma), Pongamia glabra (Karanja, Pongamia oil). Use Directions : wet body and face, apply generously and rinse.